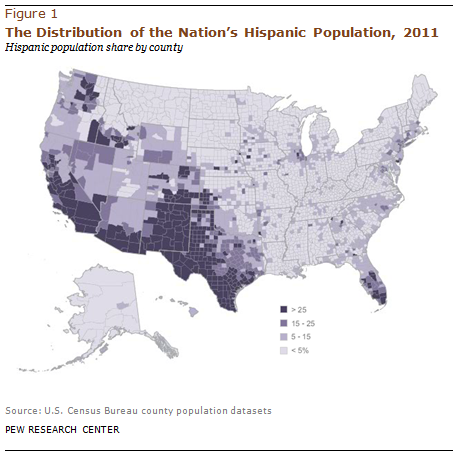 Geography: Although there’s been some dispersion in recent years, the Hispanic population remains highly concentrated. More than half (55%) of the nation’s Hispanics live in just three states — California, Texas and Florida — and 71% live in just 100 of the nation’s 3,143 counties and county-equivalents. Population size: According to the Census Bureau, there were 51.9 million U.S. Hispanics in 2011 (its latest estimate, for 2012, is just over 53 million). The Hispanic population grew 47.5% between 2000 and 2011, according to a Pew Research analysis, and accounted for more than half (55%) of total population growth over that period. Countries of origin: The umbrella term “Hispanic” embraces a wide variety of backgrounds and cultures. 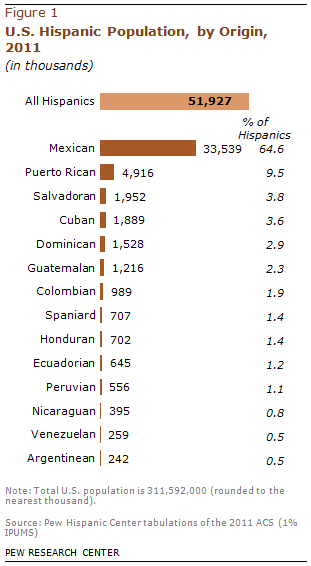 However, nearly two-thirds of U.S. Hispanics trace their family origins to Mexico; Puerto Ricans, the nation’s second-largest Hispanic-origin group, make up 9.5% of the total Hispanic population. Educational attainment: College enrollment among Hispanic high school graduates has risen over the past decade: According to the Census Bureau, 49% of young Hispanic high-school graduates were enrolled in college in 2012, surpassing the rate for white (47%) and black (45%) high-school grads. Language usage: A record 35 million (74%) Hispanics ages 5 and older speak Spanish at home. Spanish is the second-most spoken language in the United States. Nearly all U.S. Hispanics say it’s important that future generations speak Spanish.